In the last 3 months, US and Silencerco have been the only serious contributors to this section, the next would be Stalking Rhino back in September of last year. Well you guys and Silencerco are the only guys that really matter. If memory serves, stalking rhino was a bit backlogged and stopped accepting rimfire recores because of it a while back. I don't know about all that, but definitely the kings of Customer Service. It could be related. He stopped taking rimfire jailbreaks a few years ago. SR seems to be swamped either with business or projects. Every once in a while I see Matt or SinSir pop up to answer a customer inquiry that has bled over into the forum but I haven't noticed them much more than that. I'll second that but I'd put Silencerco in the back seat at the moment. They've been great in the past but recently they made no effort to help me take advantage of Papa Dave's generous sale. I had to get assistance from a [more] local dealer and with the help of Dave's awesome staff it worked out fantastic. Most just want their name spread about, that way search engine results (SEO) rise. Some grow so big, they mostly ignore everything but only post information on one aggregate (usually Fakebook). Anyway, thanks for actually communicating with your customers (present and prospective) Dave, regardless of what platform you choose. It is actually becoming a rare thing nowadays. Most of what I have seen in most places is pure PR, and very little to no interaction otherwise. It's like most companies actually try to avoid interacting with folks, especially the bigger they get. This is on my desk at eye level. My collection is limited and dated. 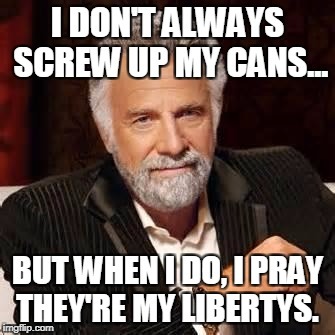 But 2/3rds of it is Liberty. I'm still waiting for an octagonal tubed, .45cal can with case hardened finish. C'mon, you guys can't add hydro-forming and heat treating/carburization process equipment for a single product? I thought you were customer oriented. This is exactly the kind of thing that happens when you're one of the few companies left capable of marching right up to the bleeding edge of suppression but then refuse to cross it. Have y'all gotten your products onto the shelves at GA Firing Line in Marietta yet? Once I'm back in the NFA buying position there are definitely a few Liberty products I'd like to add to my collection. Time is the greatest teacher... Unfortunately it kills all of its students. Now don't start saying things like that. If Twinsen starts buying Liberty's, Dave will have to declare bankruptcy and then the fountainhead of the coolest stuff in the suppressor world will become a footnote in history. We can't allow that to happen! !